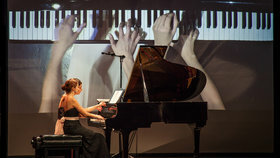 The Duo Fortin-Poirier is a “piano four hands” ensemble with two pianists, Amélie Fortin, and Marie-Christine Poirier, on one piano. Their passionate interpretations are enriched by their acute sensitivity and the remarkable affinity they share as musicians. Very prolific on the North American music scene, the Duo Fortin-Poirier created "Vingt doigts et un piano" (Twenty fingers on one piano) in 2008, the first classical music concert to be selected for the Entrées en Scène Loto-Québec (2013-2014). More recently, the duo has also played at the Festival de Lanaudière (2015), toured in the Maritimes with Debut Atlantic (2017), and performed their concert entitled "Mémoires" on tour with Prairie Debut (2016-2017). The two pianists also crisscrossed the Western states of USA on tour in April 2017. Their recordings, "Vingt doigts et un piano" (2013) and "Mémoires" (2017) are featured regularly on the program Espace Musique, on CBC-Radio Canada Premiere, and on Radio-Classique.